I saw this last week on Wil Wheaton’s blog. Kind of a cool short documentary. Here There Be Dungeons & Dragons. Strange how timing works out. Just as I notice that my nephew is playing Minecraft in a very D&D way and decide to introduce him to the Dark Arts, it seems that D&D is turning 40, releasing a new edition of the game (which looks to be getting the system back on track after some idiots messed it up), and the new rules are (sort of) released for free online. As a result, there have been some really cool articles about D&D out there this week. Here is one — about writers who’ve been influenced by the game. The New Yorker also had a great article – Dungeons & Dragons Saved My Life. 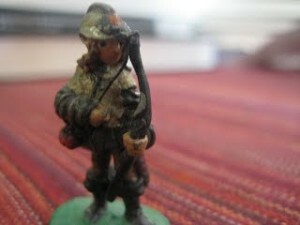 It seems that toxic lead miniatures are not available anymore. Well, that stinks. And the current metal minis are pretty expensive. But come to think of it, lead minis were not cheap either. Anyway, looks like Reaper makes some good miniatures. I will be checking them out, as I really like to paint. Not super interested in plastic minis, but who knows? Maybe they are cool. I’m just really used to painting metal. As I think back over my early days of gaming and GMing, the memories are flooding back. When I started in 1979, there weren’t hundreds of RPGs. Most of the time my friends and I played D&D, but one guy had the game Traveller, so we played that too. Eventually we all bought the game. Traveller was great because it was about space, and was really flexible. The basic set came in a box and had 3 little black books of rules. They sold a lot of supplements. I don’t think there was a single illustration in the core set. Something about the books made you feel smart. The game mechanics had rules for spaceship combat, interstellar commerce, and other cool stuff, but at 15 we mostly just blew stuff up. Get in the spaceship, go to a planet, get drunk, find a weapons dealer, buy some plasma rifles, and start killing. When the Law got on our asses we’d hop in our ship, the Hellfire, and take off, usually destroying more people and ships on the way out of the system. Mass murder and mayhem on a glorious scale. It helped that our GM 1)just wanted his friends to be happy and 2)didn’t seem to have actually read any of the rules beyond character generation. His answer to any question of skill was “roll three dice”. We had no idea what we were rolling for, and neither most likely did he, but we all had fun and that’s all that mattered. Clearly, we never got bogged down in game mechanics…heh heh. Our GM got into gaming really early. Every Wednesday night he went to this huge gaming meetup at Richland Junior College, here in Dallas. He was friends with lots of older gamers. One of them was a computer programmer. He gave our GM this gigantic hex map, with planets dotting it. Each planet had a number, and there was a computer printout on which the characteristics of each planet were given — randomly generated by a program this guy had written. Pretty cool. We were in awe. As we got older, and better game systems were released, we tended to gravitate toward the new stuff. Hero Games’ Champions was a prime example. Flexible, great combat system, etc. 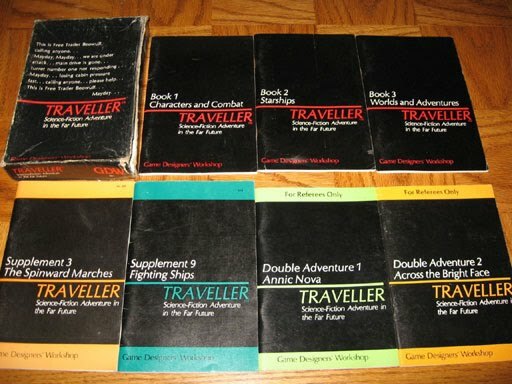 Game Designer’s Workshop, the authors of Traveller, have continued to release new editions of the game, but we never played them. We stuck to the original when we wanted hot space action. There was something really cool about that little box, with the 3 original books, and maybe having a couple of the supplemental books and a bunch of dice crammed in there. It was stripped down roleplaying. It was all on you and the GM. 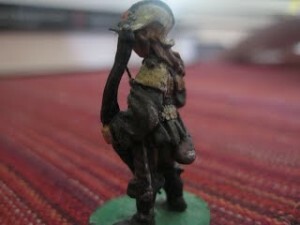 This is the last miniature I have from my old gaming days. 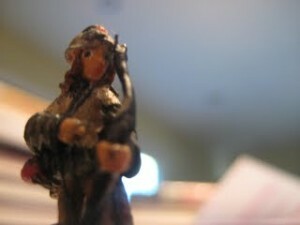 I kept it because it was the figure I used for my favorite character, elf fighter/magic-user. Soon I hope to have some cool current uplifting stuff to post, rather than nostalgia! Got my nephew some dice and a dice bag. Stoked that he is interested n D&D. 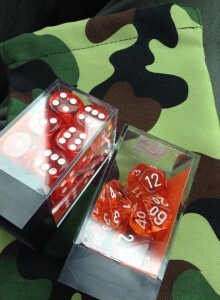 Got me some new dice too. Yay! I’m very happy that my nephew is interested in exploring RPGs. I realize he is from the video gaming generation, so his interest may be short-lived, but I think it is good for him to at least learn about the oldschool way of doing things. I am acquiring the 2nd Edition D&D rules to send him too, as well as new copies for me so I can help him out (as well as play myself). I must admit that I regret getting rid of all my gaming stuff, but man, over the last 25 years it would have been a drag having all that with me, at least when I’m not using it. Still, I wish I still had my old dice.